Windows 10 has proven to be the most stable of all operating systems from Microsoft to date as was evident from record number of downloads in just a few months after its launch last year. Those who have already installed Windows 10 or recently upgraded to it have been reporting smooth functioning and stable performance. But hardware issues are out of Microsoft’s control because they only control software side of Windows PC. And this can cause some errors to arise on Windows 10 and Windows 8/8.1 operating system, none so annoying than blue screen error and even more so System Service Exception BSOD error on Windows 10 and Windows 8.1/8. 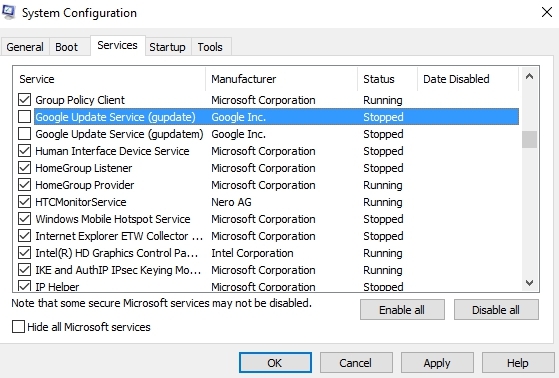 This error can appear out of nowhere repeatedly disturbing your workflow and prompting you to restart PC everything it appears. Here we are going to discuss some simple methods to fix System Service Exception Error on Windows 10/8/8.1 devices. Main reason this System Service Exception error emanates is because of faulty or incompatible drivers installed on Windows PC. This error is also common on devices with AMD or NVIDIA graphics card drivers problem. Also, sometimes Windows update KB2778344 can cause this BSOD error. Before moving on to the solutions make sure to disable antivirus, disconnect USB drive from computer and run chkdsk command. Now follow the instructions below to fix system service exception error. For this method you need to perform operations in safe mode and since its disabled by default on Windows 10, 8, 8.1 you have to enable them manually. Here is how to enable legacy advanced boot menu in Windows and how to boot into safe mode easily. Start PC in safe mode. Open deice manager from control panel: Control Panel > Hardware and sound > Device Manager. If there is any yellow triangular warning sign next to any driver, uninstall it and reinstall or update it. Those using AMD or NVIDIA graphics cards should make sure that relevant drivers are updated. If you are using Intel HD graphics drivers then update it using this guide to update Windows drivers. This should fix system service exception BSOD error. Troubleshoot Windows problems is a good way to quickly identify issues. As we mentioned above that incompatible Windows drivers can cause system errors on Windows 10/8/8.1 PC & Laptops. If that’s the case then follow instructions below to troubleshoot faulty Windows Drivers with Driver Verifier. Sometime newly installed program may not be compatible with your computer and results in system service exception error. So, uninstall recently installed program to see if that fixes the problem. You can use CCleaner tool to scan and fix faulty Windows registry that may be behind this BSOD error. Webcam driver could also be causing the problem. To uninstall it, press ‘Windows Key + X’ and open Device Manager, next right-click on webcam driver and select ‘Disable’ or update it first before disabling to see it that works. After disabling the webcam driver if you see this error message ‘anti-virus may be causing system_service_exception(ks.sys)’ then uninstall that anti-virus tool and replace it with other reliable antivirus tool on Windows 10. If none of the above solutions work to fix system service exception error then you can to perform clean install Windows or reset Windows PC. For more solution to this problem visit official Microsoft page.